It's not like Chester County residents needed another study to remind them how wonderful their home county is (there have been plenty), but there's a new one that does just that. SmartAsset, a financial technology software company, released rankings of the happiest counties in America on Wednesday. Chester County came in fourth. Loudon County, Virginia, finished first, followed by Fairfax County, Virginia, and Carver County, Minnesota. Three North Jersey counties also made the top 10: Hunterdon (fifth), Morris (sixth) and Somerset (ninth). 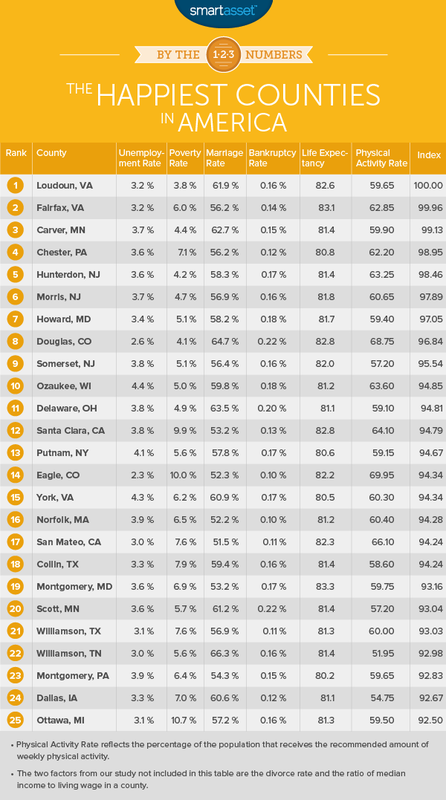 Another Philly suburb, Montgomery County, also ranked high, coming in 23rd. 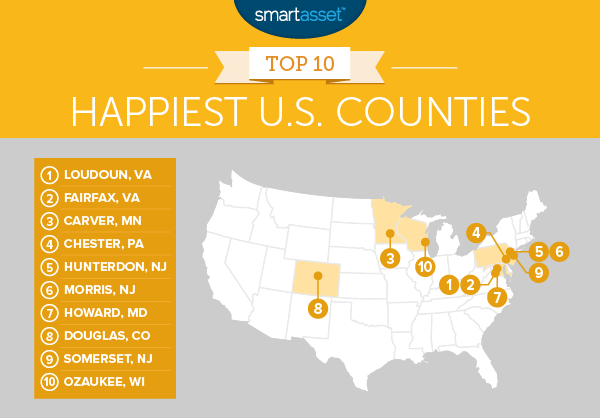 SmartAsset's rankings of the happiest counties in America. SmartAsset says it weighed eight factors in determining the rankings: life expectancy, physical activity, income, cost of living, divorce rates and marriage, unemployment and bankruptcy filings. You can find more on the study's methodology here.